We are a team of experienced and seasoned professionals, who have handled thousands of claims for home and business owners like you. We represent you the policy holder against the insurance company. The insurance company employs adjusters and experts to represent their interest. Shouldn’t you have your own expert on your side representing you? 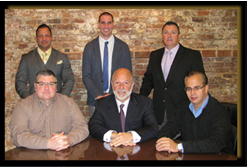 When you retain our company, you are receiving over 100 years of collective experience. When you have a claim, WE have a claim. We treat your claim like it was our very own. We strive to insure that you receive all the benefits of your insurance agreement. A public adjuster is your personal insurance claims adjuster who advocates for the policy holder in appraising and negotiating. A public adjuster is someone you need on your side when tragedy strikes to protect you and become a check and balance and liaison between you and the carrier. Insurance companies are multimillion dollar businesses, they are in business to collect and invest premiums, and they are not into payments. We are specialists who understand insurance companies and their policies. We review your policy and coverage, we prepare claims and submit them to the insurance company and negotiate a settlement. We take the burden of claims preparation of you and your staff and place the claim preparation squarely on our shoulders. Many people have claims and handle it themselves. Afterward they always wonder hoe much money was left on the table; with North Jersey Public Adjusters on your side, you will never have to wonder.